The hospitality industry is currently riding a wave of growth. Business travel reached an unprecedented $1.2 trillion around the world in 2015 and healthy growth is projected to continue through 2017—though competition for those dollars has been and will continue to be fierce, with new brands and new hospitality and F&B concepts emerging, and a climate where innovation and creativity are rewarded. The status quo is no longer acceptable, especially in F&B concepts—the boring three meal a day restaurant is dead, hence the huge rise in independents over the last few years and the establishment of soft brands. Today’s ‘big thing’ is tomorrow’s ‘no big deal’ and it is incumbent upon F&B professionals to recognize and respond to those shifts. While big-picture economic factors always play an important role in influencing what the landscape of the industry will look like in the months and years ahead, this is a space that is increasingly tied to consumer preferences and expectations—both of which can and do continue to change over time. While it may not seem like a game-changing insight to point out that successful hoteliers and F&B operators can succeed by meeting the needs of their customer base, the value of understanding and being responsive to guest and diner preferences and priorities continues to grow. As a growing differentiator and a driver of the experiential variable that is so important for a hotel/restaurant property these days, F&B is especially sensitive to those shifting sentiments. As those preferences—and, consequently, those consumer expectations evolve, brands that are aware of and responsive to will find that they are positioning themselves for success in a crowded and competitive industry. Today, three of the most prominent and important consumer trends in the F&B space are a growing preference for authenticity, a desire for more personalization, and unique, one-of-a-kind experiences across the board. Appreciation for authenticity is one of the most significant—and also the most challenging—shifts in consumer’s preference that hoteliers and F&B professionals must grapple with. A big part of that challenge is that authenticity is, by its very nature, an elusive concept: sometimes the harder a product or experience tries to be authentic, the less authentic it actually feels. Studies have shown that F&B consumers, especially the increasingly influential and important Millennial demographic, view authenticity through two seemingly contradictory lenses. On the one hand, there is that growing appreciation for independent products that was mentioned above and distinctive F&B concepts that utilize a high proportion of locally sourced and/or organic ingredients. From craft beer and creative cocktails, to custom menus and creative and unique spaces and places, offbeat brands and F&B offerings connect with consumers in a way that feels authentic and impactful. At the same time, however, Millennials see authenticity in more than just local brands or independent operators: they also perceive authenticity in some of the most iconic and familiar products on the planet. Brands like Coca-Cola and Starbucks are cited favorably by Millennials, not for their independence, but for their simplicity and consistency. A clear, strong and unambiguous brand identity that consumers feel connected to can resonate with a sense of authenticity that is just as meaningful as a craft brewery or local farm-to-table restaurant. As F&B operators design menus and marketing campaigns, they should keep this appeal to authenticity top of mind, and should strive to deliver brands, environments and experiences that are memorably distinctive. From menus to experiences, to décor and aesthetics, personalization has shifted into being a key consumer priority in 2017. Personalization, and an interactive and engaging environment/experience is one of the surest ways to leave guests and diners with a feeling that they are being catered to—while fostering an indelible and all-important sense of place. To their credit, many F&B operators are getting more creative and thoughtful with ways to do just that, adding small experiences and customization elements to their restaurants, their menus and their service profile. Part of that is creating an environment conducive to social engagement, capitalizing on the energy and activation of a space where guests are mingling and interacting with each other. Other strategies include more flexible menus, tableside cocktail mixing or food preparation, and create-it-yourself opportunities such as mobile stations or dessert buffets. Increased chef engagement with guests through tableside visits is another way to provide personal input and engagement, and make diners feel not only feel appreciated, but connected to the food and the establishment in a way that is difficult to replicate through other means. While the hospitality industry is getting better at collecting and leveraging guest data and providing them with a customized and convenient experience, the industry still lags behind leaders in this space in retail and other industries. F&B operators should consider using social media and an emerging suite of digital tools to deliver personalized and targeted marketing and messaging—as well as to communicate directly with guests. Reinforcing that sense of personalization and customized engagement both inside and outside the hotel, bar or restaurant is one of the surest ways to keep guests connected—and coming back. Another important consumer preference that F&B professionals need to be thinking about in 2017 is the “child” of personalization and authenticity—a unique, one-of-a-kind experience. With the blending of a truly authentic atmosphere and personalization in choices and offerings, the sweet spot that is created allows the most influential demographics an experience that they cannot liken to any other. When a dinner out, or drinks out, can become something so uniquely singular in its experience—then the creation of having accomplished a home run has occurred. With that creation, frequent visits line up, posting to social is rampant and the organic growth of a concept takes flight. Leveraging the paternal and maternal influences of authentic and personal choices and offerings allows the guest to get lost in what is special about multiple places. This intrinsic desire to have an experience be special and remain that way is basic human psychology and it drives the need for the guest to share and appreciate the experience. As hoteliers and F&B operators move forward, they should work to keep these shifting consumer preferences and priorities at the forefront of their professional planning. Today’s “big thing” is tomorrow’s “no big deal” and it is incumbent upon F&B professionals to recognize and respond to those shifts. In an industry so sensitive to social, economic and culinary trends, and so reliant on the powerful personal connections that can form when consumers feel connected and fulfilled, the ability to stay in touch with evolving consumer sentiment can literally mean the difference between success and stagnation. 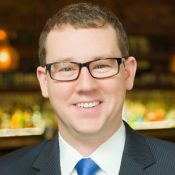 Justin Harkey serves as Director of Food & Beverage for Rosemont,IL-based First Hospitality Group, Inc. He oversees execution of all food and beverage operations and strategies, focusing on growth and on consistency with trends. Harkey has 15 years of operations experience in the hospitality industry.